Sean and I are currently in a mess. I’m studying for my MCAT, he’s working on his thesis for his Masters. He works full time (as a graduate student), and I work part-time but volunteer at 3 different places. We’re visiting Paris late August, and then we’re moving to the Netherlands from September until late December (possibly doing Christmas in Denmark). He’s doing research while we’re there, and I don’t know what I’m doing. In the midst of this, his supervisor has gone on vacation for a month and needs someone to housesit and cat sit. We’re splitting the month with another couple, but it’s already stressful. The house is lovely, the cats are lovely, but the going back and forth between everywhere is already leaving me feeling a bit ragged. The point though is that life happens, and when life happens you either don’t adapt and struggle or adapt and develop a new rhythm. I have yet to develop a new rhythm that includes keeping my blogs up to date, or even really cooking. When I’m cooking, it’s easy peasy boring stuff like pasta or soup. I’ve been eating a lot of low-maintenance food lately like fruit and granola bars. A lot of coffee. Last night though, after our plans of attending a breakfast potluck were abandoned (what types of food can you even bring to a breakfast potluck? I don’t really like breakfast food…) we decided to make dinner in the gorgeous kitchen of the house we’re cavorting in. For some reason, I decided we should have enchiladas. We’ve never made enchiladas before, nor have we ever eaten them! We’ve had burritos and tacos, but never enchiladas. I felt creative, and it sounded tasty so we decided to go ahead with it. 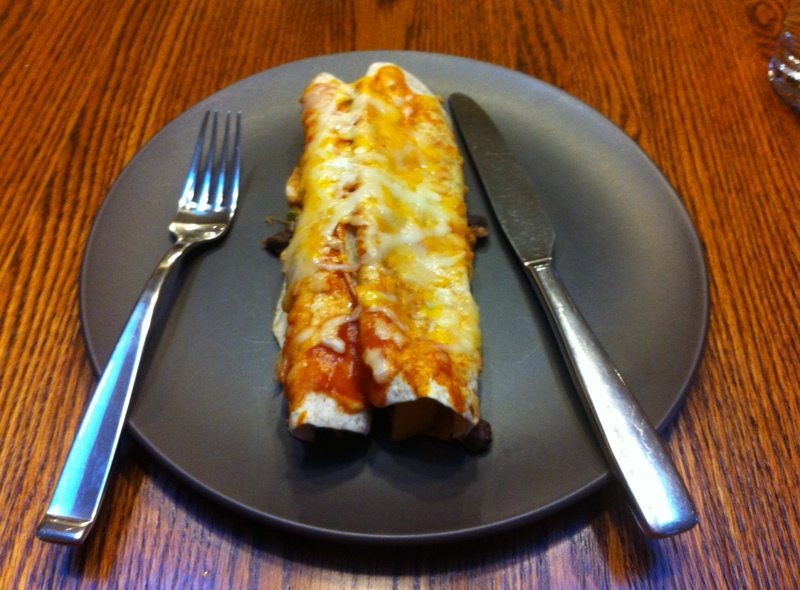 I googled enchilada recipes and found a few, and just kind of jammed them together to create our own enchiladas. While Sean went to pick up groceries, I acquainted myself with the kitchen and tried to find what we would need. I had difficulties getting the oven pre-heating, and we ran into some problems with the stove top. The stove is quite cool, it uses magnetic induction to cook! Anyways, Sean took a grocery list and called me frantically trying to find enchilada sauce. No one in the grocery store would help, so we made a judgment call and he bought taco sauce. I then learned that enchilada sauce doesn’t exist (seemingly) in Canada? How strange. But we preserved, and while it was a lot of work (mostly just prep work), it came together and was delicious! After rinsing black beans, divide half of the beans into a bowl and mash until smooth. Prep vegetables accordingly (i.e. dice onion, garlic, pepper, jalapeno, cilantro). On medium heat add EVOO to pan, saute onions for 5-7 minutes. Add pepper and saute for an additional 4-5 minutes. Add garlic, saute for 30 seconds then add mashed black beans and whole black beans. Combine well. Add a bit of chili powder (to taste). Continue to cook for 5 minutes, or until the beans are heated. Remove from heat. In a large mixing bowl, combine the filling ingredients along with the cilantro and jalapeno. Add enchilada sauce and combine. Heat tortillas in microwave for 30 seconds, until pliable. Then begin to spoon filling into tortilla, wrap and place tortilla seam side down in a large pan. Continue this process until all the filling is used. Coat tortillas with enchilada sauce, then cover with shredded cheese. Wrap with tin foil and put in oven for 10 minutes. After 10 minutes, remove tin foil and put back until cheese is bubbly (3-5 minutes). We served these up 2 at a time, and found them to be very filling. I ate 2, Sean ate 3 so we still have a lot of left overs which is wonderful. I don’t know how authentic these are, but I do know they were satisfying and I appreciated how much protein was in them. I think they’d be great left overs for breakfast (but that’s because I like eating dinner for breakfast!) and they’d probably freeze well (I’d say freeze without covering with enchilada sauce/cheese though). You may find the cooking times vary a bit for you, be careful with it. While we cooked everything for long periods of time, I found the peppers never really got soft and I think it was because the stove used magnetic induction. I’ll have to try it out on my stove sometime though. Anywho, this was a delicious and easy recipe. The prepping was the most time-consuming! I think next time I may add more vegetables like corn, and maybe mix kidney beans with the black beans.